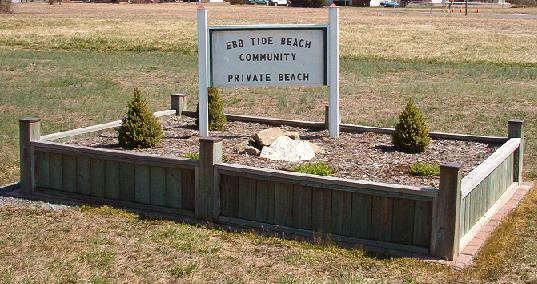 Ebb Tide Beach is one of the subdivisions in the Colonial Beach zip code, and it happens to be one of my favorite. I just love the private beach, the water views and the great people who make up this community. It's very peaceful and quiet here - you have to pass by a farm just to get to the area, yet you're still close to town and all the amenities. The community area has a private fishing pier, boat ramp, gazebo, volleyball nets and covered picnic pavilion. There's also a great wide sandy beach. Guests of dues-paying residents can use these facilities. 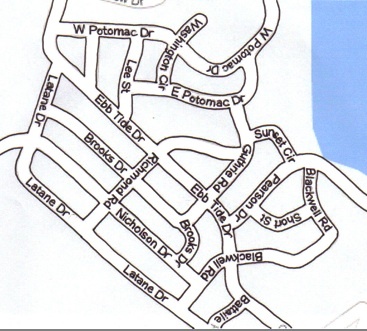 This neighborhood, just like the Town of Colonial Beach, is a designated golf cart area too, so don't be surprised if you see a lot of them on the streets. Ebb Tide Beach in the news headlines! If you take the main road (Ebb Tide Drive) straight through until it ends, you'll find yourself at the entrance to the Church Point section. As the story goes, the place got it's name due to the existence of a church in this area during the times when George Washington was around. His birthplace is just a stone's throw from here, as the crow flies. These days, instead of a church, there are half-million and million-dollar homes on this land, half of which are waterfront. Back in the Ebb Tide section, there's a good mix of year-round residents and vacation homes. New houses are being built, and there are some choice empty lots available as well, in case you'd like to have a house built here. Sewer lines were recently installed, so there's an alternative to having a septic tank. The neighborhood Community Association hosts a number of events throughout the year, including a "Tax Relief" party in April, 4th of July Parade, Labor Day "Luau" party, yard sale, and Christmas party and Holiday Caroling/Hayride/Bonfire.